(0 Customer Reviews) | Write Review 6 issues per year Download Traction magazine, which celebrates classic diesel and electric locomotives from around the UK and Europe. This magazine is bi-monthly. 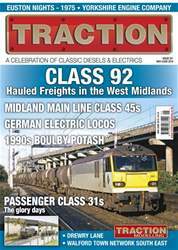 Download Traction magazine, which celebrates classic diesel and electric locomotives from around the UK and Europe. This magazine is bi-monthly. You'll receive 6 issues during a 1 year Traction magazine subscription. You'll receive 6 issues during a 1 year Traction magazine print subscription.